Reflecting on My Time at Gervay-Hague Lab! With my internship at Gervay-Hague Lab at UC Davis coming to an end, I am very happy to see that I have met my defined learning goals. I certainly learned a lot during this 10-week period, and I will use everything I have learned in my classes and future research. My academic goal was to use what I learned from performing research in Gervay-Hague Lab to become more adept in my Chemistry and Biology courses, and to be able to reference my lab experiences with these courses. I have no doubt that everything I have learned this summer will help me in my two remaining lab courses: Advanced Materials Chemistry Lab & Advanced Organic Chemistry Lab. 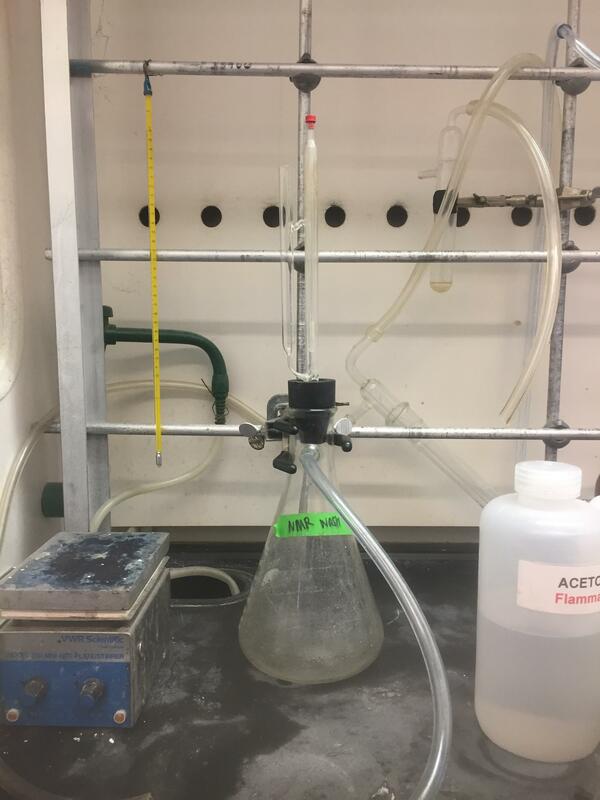 Additionally, the synthetic chemistry I performed over the summer will even help in my Medicinal Enzymology course since I will be able to understand what steps go into the synthesis of a new drug. My career goal was to further explore what field of Chemistry I would like to go into for a job as well as graduate school. After researching this summer, I am not sure exactly what area of Chemistry I am most interested in. But, I am very happy that I got some experience in Chemical Biology, so I can further consider this as a potential career path. My personal goal was to learn how to communicate my research to others through posters, papers, and in person. I have certainly learned how to communicate my research through group meetings, keeping my lab notebook, reading relevant articles and posters, and discussing my research other people in the lab on a daily basis. 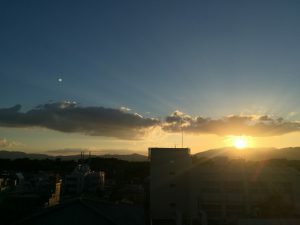 Became familiar with lab techniques such as dry transfer and the use of MestReNova, an NMR analysis program. Learned to use various lab apparatuses such as argon chamber, oven, microwave, rotovap, MPLC, and NMR (1H, 13C, COSY). 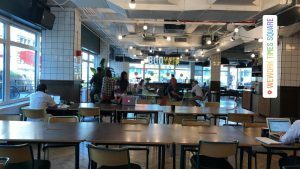 Learned how academic labs work and what it’s like to be part of a PhD program. This is the main lab that I worked in, the synthesis lab. It consisted of the MPLC, the argon gas, an IR machine, and a microwave. Additionally, the TLC station was set up in the hood, and reactions were run in this room. Working a full-time job (nearly) is quite difficult and very different than working and studying in college. It is very rewarding to be given a project, work tirelessly on it, and see it through. Planning is crucial in all different fields. It is amazing how much can be done day-to-day and week-to-week researching in a lab, yet how long it takes to come to distinct conclusions. This summer, I am most proud of beginning to research in a lab, something I have wanted to do for quite some time now. I am also very proud of all the hard work I have put into my research and that I have learned so much during my 10 weeks at Gervay-Hague Lab! Author dcfarbPosted on August 21, 2018 August 23, 2018 Categories WOW FellowshipLeave a comment on Reflecting on My Time at Gervay-Hague Lab! It has been quite a journey getting to the middle part of my internship. 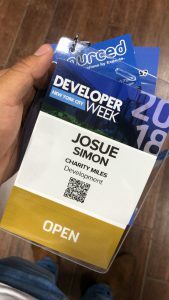 In the first few weeks at Charity Miles, my supervisor gave me an overview of what was expected of me. The expectations sounded like a lot, but her reassurance helped me be aware that I was not alone in this internship as she was a message away on Slack and a few steps away in person. 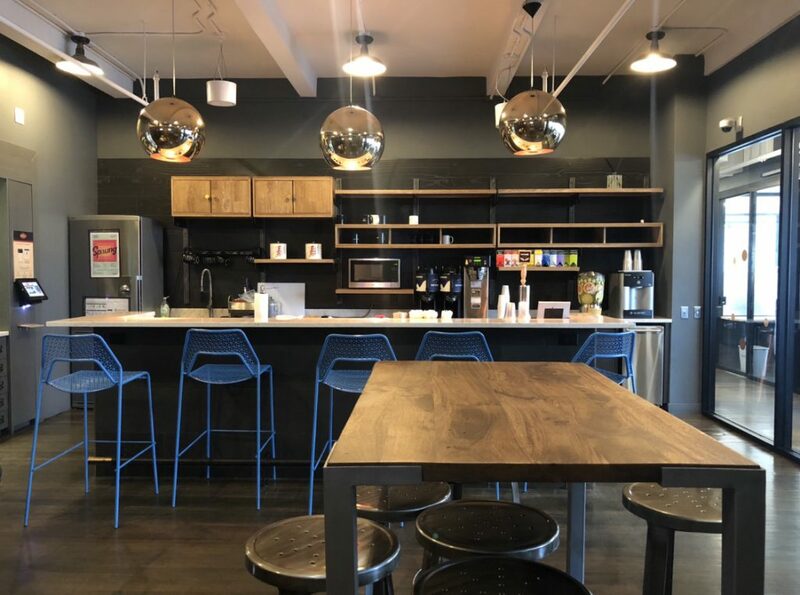 With more than a month into my internship, I still had a lot of work regarding my HubSpot project, which I had been working on since my second week. This project consisted of finding company sales contacts in order to build possible partnerships with. I was still fairly new to the HubSpot software. However, I had the basics down which helped me to complete the task. My supervisor was kind enough to give me the option of becoming certified with the HubSpot sales software through the subscription the company held. She gave me one day in the week to dedicate myself to watch the videos associated with the certificate. At the end of all of the training videos, I took the exam—which I had to take more than once as I was not able to score high enough the first few times to get certified. I was fortunate enough to be able to set up a phone call with a company that had reached out to me. The company’s intentions were not too clear but my supervisor worried less about that and worried more about me sitting in for a call in which she would be speaking about Charity Miles and potential partnerships. It was a great opportunity to see the integrity that my supervisor had during the phone call. After a month and a half of working on finding contacts for the companies, I was finally able to say, “I’m finished finding the person of contact for these 900 companies.” It was a great relief because it was very tedious work and at times, would take a long time. 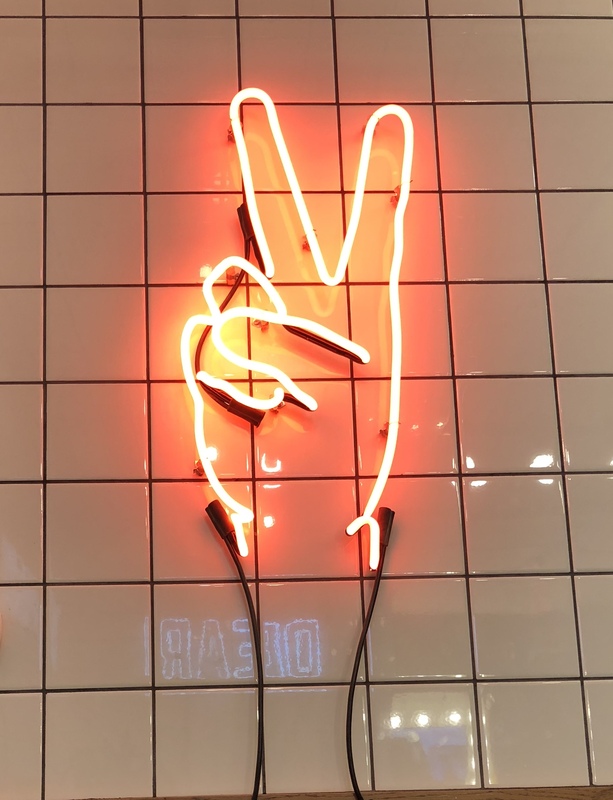 Though I had finished the first part of this HubSpot, the second part was right there waiting for me; linking the new person of contact for these companies in the HubSpot program. Some of the companies were new that were trying to be contacted so for those companies, I also had to build a profile. This became a great practice for me in learning how to network and not give up in attempting to build relationships among companies. This gave me practice and knowledge that I can transfer to any workplace when it comes to working with clients or actual companies themselves. 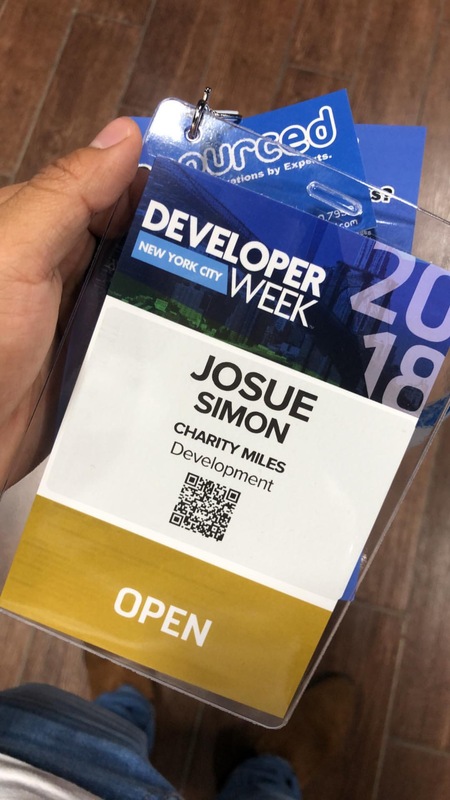 The last few days have approached during my summer internship at one of the top-rated mobile health apps—Charity Miles. 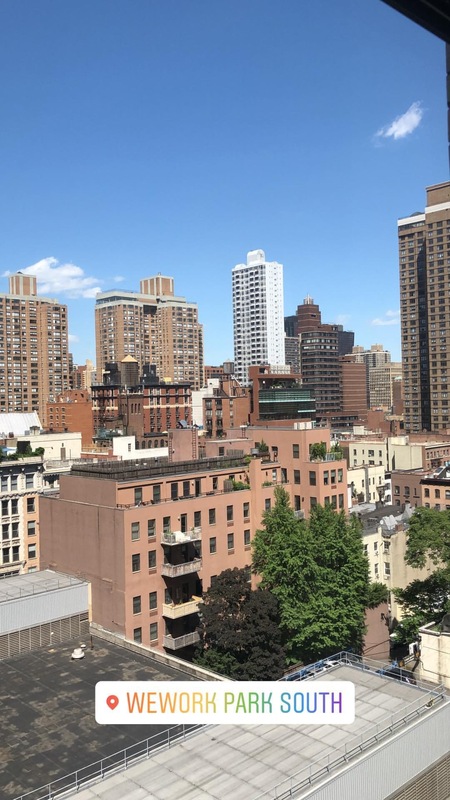 Waking up early in the morning, hitting the gym and getting ready to hit downtown Manhattan became a routine this summer. A great friendship has developed between the other intern, my supervisor and myself. 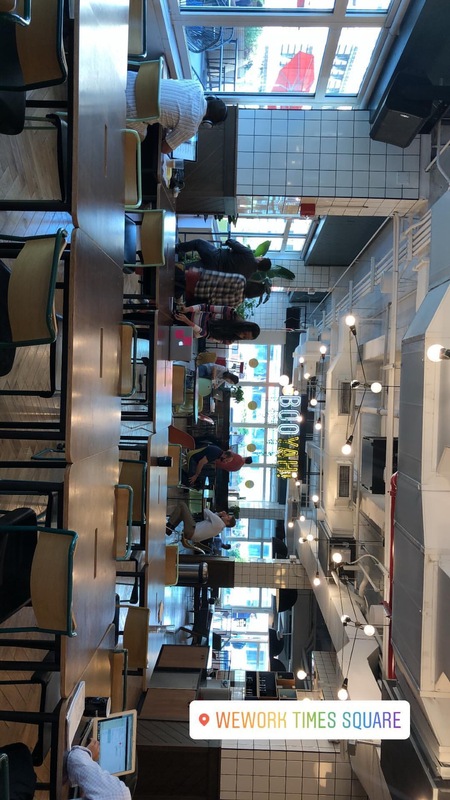 One day, my supervisor decided to switch up our workspace and do work at another WeWork location in Times Square. It was a great day and I got to meet an old partner of my supervisor who gave me insight into the marketing aspect of sales. She explained to me how marketing can be done for free through the use of social media. But to top it off, it was also a nice bonding experience with the other intern and my supervisor as we were able to go into the game room and spend some time there. The great part about my supervisor is she is always on the lookout for me to attend events. 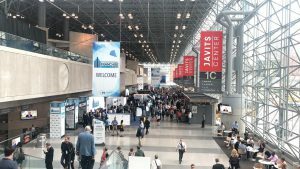 Recently she got me a ticket for a tech expo and though I attended alone, it was a great way to expand my network. I also got to see computer scientists doing work which is great because it is one of my majors. 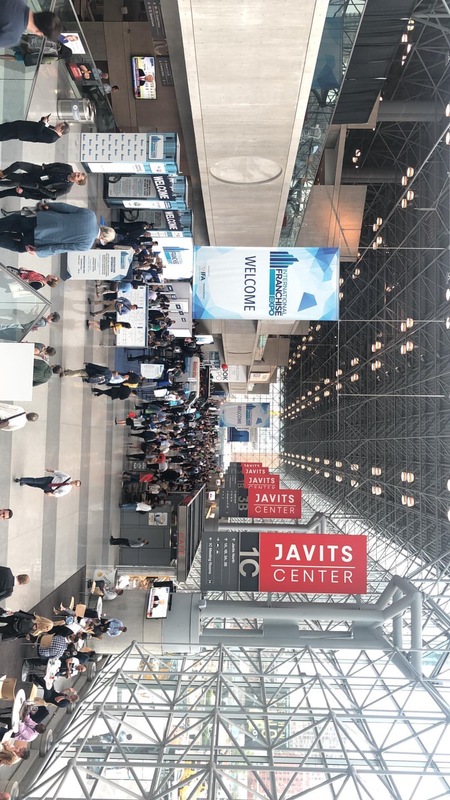 As the day went on, I was able to speak to a lot of companies, get free items, and also sit in for a few talks from some very successful entrepreneurs. Back in the office I finished off my second part of my HubSpot project and moved onto the third. Now that I had finished creating and linking new contact profiles with company profiles, it was time to actually start reaching out to companies. This third part consisted of building a sequence of five emails to be sent out to companies. This became the last part of the project which I finished the second to last day at the office. By the end of my internship, I successfully met the learning goals that I had set myself up with. 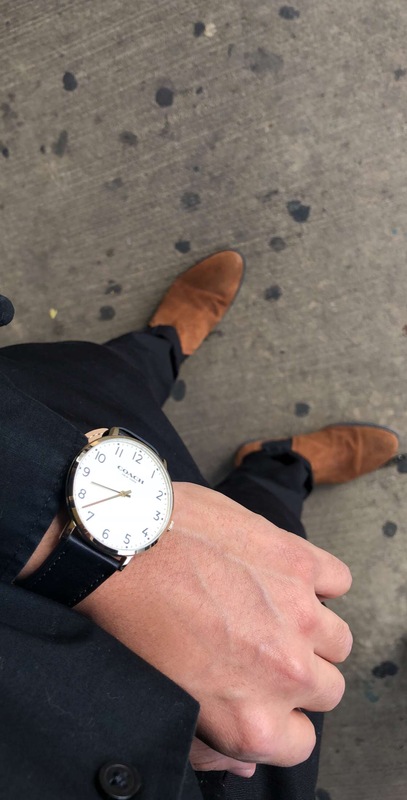 By constantly deciding which companies to reach out to, after a while I became familiar with what classified a company as successful and worth reaching out to. To add on, I decided I favored my computer science major, as it is very sought after by a lot of companies and work can be done remotely. Nowadays, coders carry a big importance. Last but not least, I learned a lot about a startup company and the many struggles it experiences during the early stages. The advice I could give to a student interested in Charity Miles is to not be afraid to ask questions because you are there to learn. Also, not to become discouraged when companies do not get back to the emails you send to out. 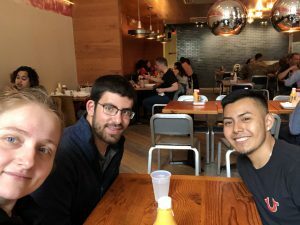 On the last day, my supervisor took the other intern and me out to lunch as a way to say thank you for our work. We spent time speaking about how work had gone that summer and all that had been accomplished amongst us as a team. My time at Charity Miles was great because of the people I got to meet and my supervisor, most of all who made it enjoyable. The bond developed with her and her knowledge encouraged me to continue persevering. At this point, I have spent a month and a half interning at Westchester Day School. 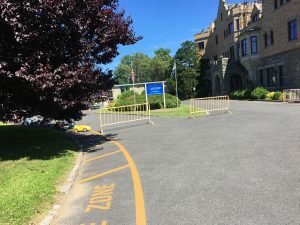 The most eye-opening part of the summer so far has been the week after the students left. While the students were in school, it was loud and busy, and I had many tasks involving being a substitute for classes, helping out teachers, and observing classes. 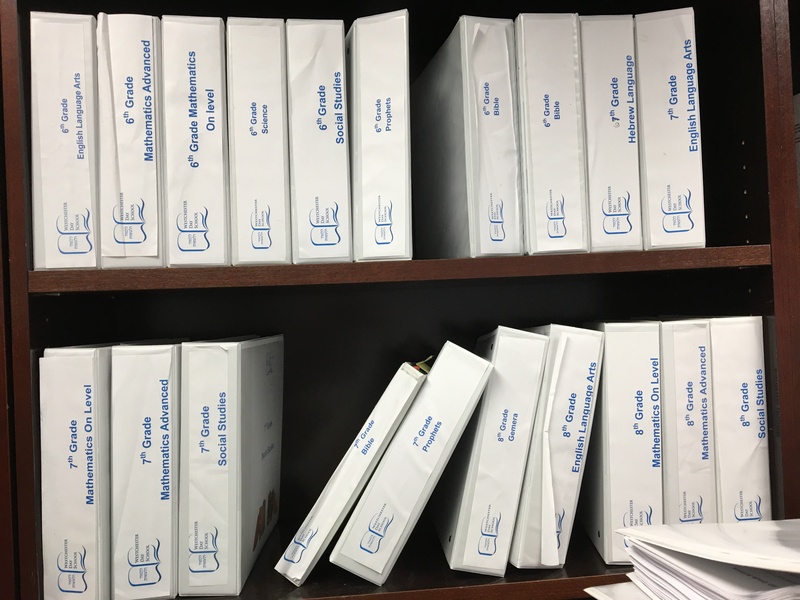 However, now that the students are gone for the summer, it is quiet, I spend more time in the office at a desk, and have more time to work on my summer projects on organizing the curriculum and unit plans of each grade and subject. There is something that I have noticed at many different moments throughout the past month and a half about the environment and the workplace. Through sitting in on teacher meetings, administrative meetings, and professional development sessions, I have noticed that the staff, teachers and administrators, are very unified. They have a great relationship both working together as colleagues, and even more so, as people inside and outside of the school environment. This was something that made a big impact on my thoughts and emotions about being a teacher and being in an education environment. This is something very special that this teaching staff has. This world of work being in the education environment and observing teachers and classes is very different than my academic life sitting in on classes about learning how to teach. I am having the opportunity in this internship to put what I have learned in my classes about how to teach students into the real world and real life experiences. Speaking to the teachers about their classes, students, and methods used has given me a different lens on the information I have learned in my classes. While I can learn in my classes and from textbooks “how to teach”, talking to different teachers about their experiences, their growth as teachers, and being able to differentiate their teaching for all of their students is what gave me the most valuable information. 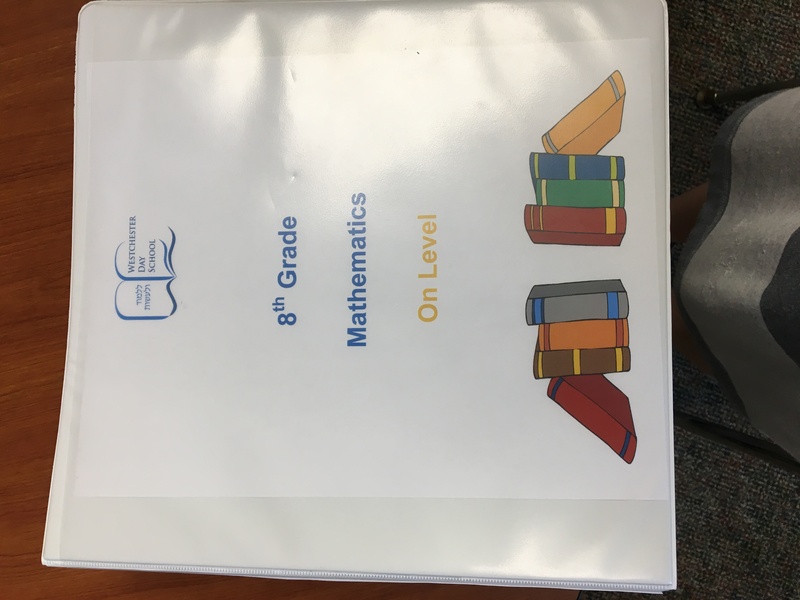 I am working on a project where I look through binders upon binders of curriculum from different grades and different subjects and examining and analyzing the information and the way it is being taught. One specific thing I am learning through this project is finding the important parts and separating that from the other parts which are less relevant. The curriculum project I am working on requires me to look through unit and lesson plans and analyze them to see the overarching themes among the middle school grades, if the information flows from year to year, if the different subjects flow as well, and if there is anything repeated in the different curricula. By looking through dozens of binders and curricula, and writing up my findings, I have learned that there are some aspects that are important, but not necessarily important for this specific project. Additionally, one other skill I am learning is how to talk and act professionally. This is my first job outside of being a camp counselor, so I am learning how to act professionally. Although every job and work environment is different, these work ethics, attire choices, and conversational skills will help me at any future job that I will have. These are some of the binders which I looked through, examined, and analyzed for my project. 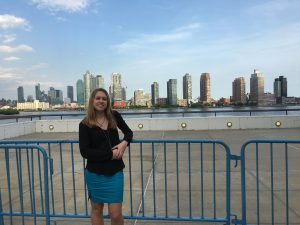 My name is Devorah Meyers and I am a rising junior at Brandeis University majoring in education. 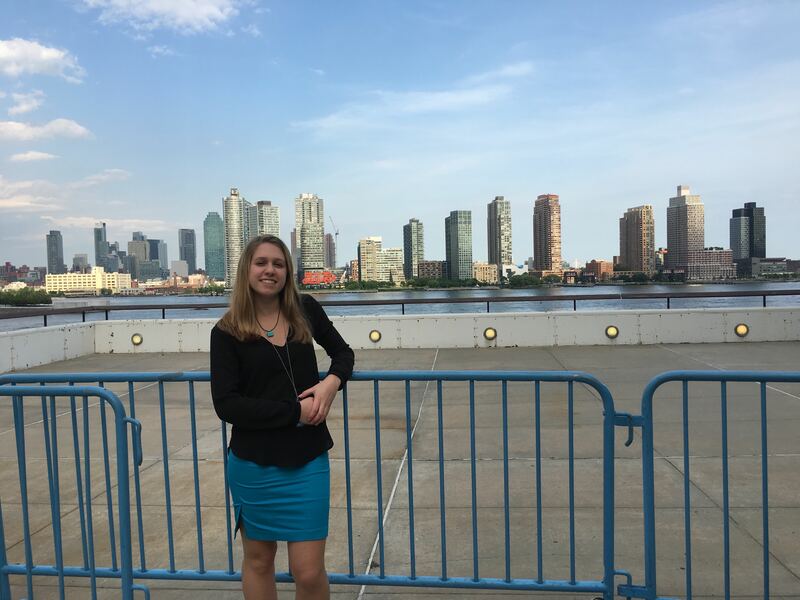 This summer I wanted to find an opportunity to be in a school environment which led me to become an intern at Westchester Day School, a Jewish preschool through 8th grade day school in Westchester, New York. I will be specifically interning and shadowing the principal of the middle school. Westchester Day School is a modern-orthodox, co-educational school which values both the values of Jewish culture as well as the American culture and be able to infuse them. This first week, I experienced and saw many aspects of a school which I was never exposed to as a student. I was able to sit in on meetings with individual teachers and the principal as well as grade meetings with teachers and administrators where they talk about what is going on in that grade, ways to help certain students, and challenging things that happened recently. Because of confidentiality of the administration, teachers, and students, there are many things which I cannot share about these meetings. These meetings gave me a new view of being a teacher or administrator. The middle school staff was so united and all brainstormed ways to help out each other. Additionally, I was able to sit in on some of the meetings which the principal had with some students to discuss aspects that they want to change in the school, as well as social and academic issues. These meetings were very surprising to me, as when I was a middle school student I was terrified of my principal and would only go to the office if I was in trouble. Sitting in on these meetings showed me a different way to be a principal in a school. The principal that I am shadowing wants to have a positive relationship with the students and the students as well want to have a positive relationship with her. Additionally, I have covered many classes in the past week. I did not feel comfortable enough teaching a lesson to the students, so instead, with the permission of the teachers, I gave them work which the teachers gave me ahead of the class period. Although I was not teaching the students directly, I had the opportunity to be in the classroom with the students. This gave me the opportunity to see what a middle school classroom is like, how it functions, the challenge of controlling the behavior of the students, and seeing the different personalities of students both socially and academically. This is extremely valuable for me as an aspiring teacher to be in the classroom with the students and begin to develop a relationship with a handful of them. I am very thankful for this opportunity and believe that it was very valuable for me to be in the classroom with students. In addition to covering classes, I have also had the opportunity to observe classes and teachers. I have seen different ways and methods used by the teachers to teach different subjects and specific students. I have also had the opportunity to talk to the teachers after observing their classes to hear the reasons behind the strategies they use, the students who need more help and attention, and how to give them what they need. This was also very valuable for me to see and do because I was able to see the students and teachers in their environment and observe how a classroom functions. It was also very helpful to debrief with the teachers after the classes so I was able to understand why they repeated certain things, the abilities of the students, and the methods which work best for the class. I hope through this summer and my projects I will be able to reach my goals of learning about the “behind the scenes of education,” including curriculum development and planning, scheduling, administrative work, hearing teacher’s feedback on their classes, and professional development. 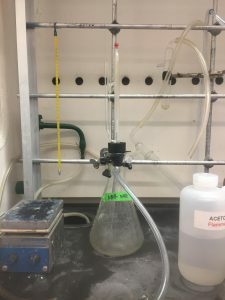 With my internship being at the midpoint, I have learned many lab techniques from such as dry transfer between vessels, analysis techniques like NMR and COSY, as well as the use of the argon chamber, drying oven, and microwave instrument. But, in addition to these various lab techniques, I have also learned valuable workplace techniques that can be applied to the lab, academics, and any job. Some of these techniques include multitasking, planning, and time-management. Most days, there are certain things that need to get done, and I have to figure out a plan to ensure I can get everything done that day. This requires both planning and time management. In accordance with this, I frequently have to do multiple things at the same time. For example, when I am waiting for a TLC plate to finish, I have to take advantage of those few minutes by setting up the next TLC plate. This requires multitasking. Little things like this ensure that everything runs according to the schedule that I set for myself. But, there are certainly some challenges that I have faced while researching at JGH lab. The most difficult and frustrating challenges that I have faced are when different instruments don’t work properly. For example, sometimes the GRACE doesn’t properly recognize when peaks occur, so I have to spend more time analyzing that and determining exactly when they occurred. Additionally, sometimes spots don’t appear on the TLC plates. So, I have to redo them. All of this takes time and perseverance. But, it’s part of science, and I think people in all areas can learn from pushing past challenges like these. Wakamatsu Farm has a total area of 272 acres. This is a great view of the trees and different shrubbery at Wakamatsu Farm. The plants in this picture are both Camellia sinensis, the tea plant that JGH Lab is studying. Camellia sinensis can be used to make many different kinds of tea such as green tea, black tea, yellow tea, white tea, and oolong tea. 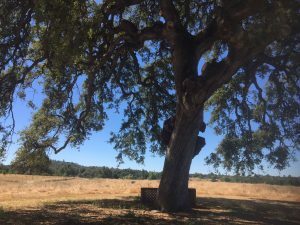 Here is the link to the Wakamatsu Farm website for more fun and historical information. I thought it was very interesting to spend over a month doing research that ultimately focuses on this one plant, and then we got to go to this farm that grows that plant. It brought about an interesting connection between science and agriculture. I am looking forward to what the rest of my internship brings! I’m am at the midpoint of my internship with Brandeis Professor Eric Olsen, studying the relationship of deer, ticks, and Lyme disease in the city of Weston, MA. 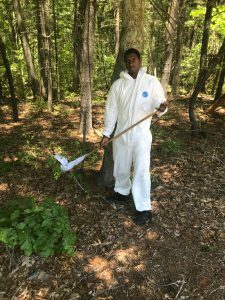 I have learned and experience a lot since my first days with the tick surveys. When I first came into this internship I viewed it as being a traditional internship where I would just be doing minor things like helping prepare the tools that we needed for a routine survey, assisting in the input of data, filing things etc. Now as I am in the midpoint of this internship I couldn’t have been more wrong. The way that Professor Eric Olson coordinated the internship, it was as if I was conducting my own research. We both did the same amount of work, followed the same procedures, and both worked towards a common goal. After a regular day of collecting and looking at the information I collected, it left me with a feeling of accomplishment. Knowing that I was finally getting the resources that I never had leading up to my involvement in the WOW fellowship program is like a feeling of liberation. I have also been learning about different tick species, the history of our seven different locations, how certain terrains form naturally and other interesting facts. It’s is weird seeing how different it is learning things about nature from a professor outside a classroom setting. It’s a lot less stressful and more like a gift rather than a chore. I found myself listening to what he had to say and retaining the information more than I would have in a classroom. I started to see myself noticing different types of plants like bedstraw, and milkweed. While my knowledge on how to identify the all the different types of plants there are, it has gotten a lot better just hearing him talk about them. This internship also allowed me to really see how much I love being in nature. The city of Weston has some of the most beautiful forests I ever have seen. Just walking into one you can see the lush green vegetation of the forest, the smell of pollen and wildflowers, hear the scuffle of animals in the leaf litter, and think about just how peaceful it is being in the woods. It’s sort of a distraction from our daily lives and to just become apart of an ecosystem that many of us have lost touch with. It reminds me of a class that I took during the fall semester of my freshman year where we had to observe a specific place in the woods that we chose and just try to connect the place as much as possible. We were told to observe the trees, notice if anything change, to use it as something therapeutic in our lives, and this internship is just like that. I have been able to use this internship as a way to take time away from working two jobs, having to worry about paying for things and helping my family. All in all, I have really been enjoying the internship. It has been a good experience so far and I have been able to learn about many different things that I probably wouldn’t know about if I didn’t do this internship. Today I started my internship I have to say it was not what I imagined. I came into this internship thinking that I may be bored with having to do continuous walks in the forest looking for ticks and it taking forever. To my surprise I was wrong. 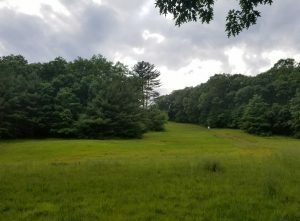 It’s actually amazing to see just how many ticks there are in different parks in Weston where people go every day to go for hikes, walk their dogs or just go for a stroll on a beautiful day. Pretty much anytime I walked off the path, I managed to get one or two adult ticks crawling up my leg ready to make a meal out of me. 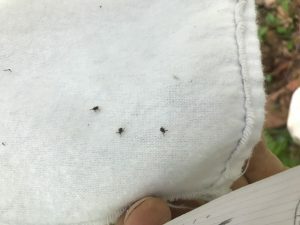 In addition to that, once you get the hang of the methods of preparing the tool that we use, to actually collecting the ticks, it manages to go by pretty fast. 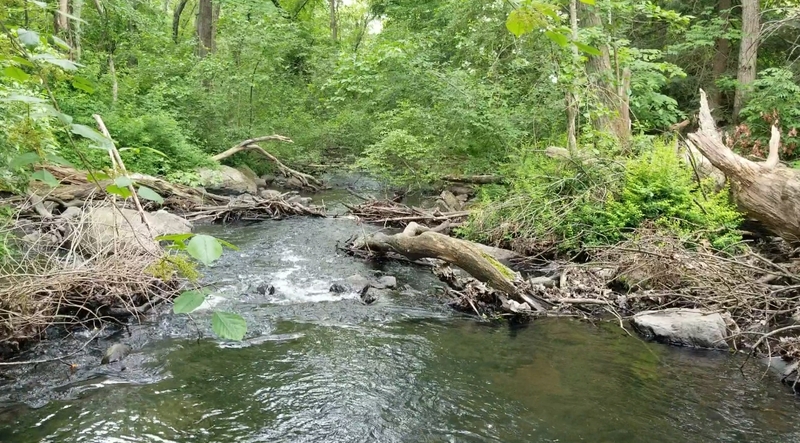 On our first day, we went to one of the locations named Jericho Forest: Sunday Woods. When we got there it was bright, warm, flush with vegetation, while at the same time with a lot of dead young trees that littered the floor like garbage. We started off by going over the procedure of how to sweep and was taught how to hold the stick, how long to walk for before we check the flag, and also how to identify the ticks. At first, neither one of us were getting any ticks on tour flags and then out of nowhere ticks started popping out the woodworks. There would be sometimes that we would get multiple ticks on the cloth at once. We ended the day collecting seven ticks and I learned the difference between dog ticks, deer ticks, which one is a male which one was a female, etc. There was really only one downside to being in those woods, and it was the mosquitos. They manage to eat me up alive. Even though I was covered up from head to toe, they still manage to attack my hands and left me with plenty of itchy bumps that lasted for a couple of days. In addition, I also helped professor Olson with another project that he had going on planting a tree for a memorial. 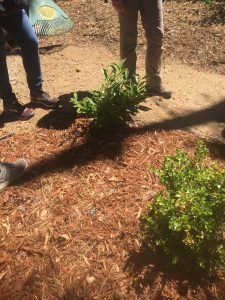 Before we actually planted the tree, I didn’t know that it was so much going into trying to plant a tree. I didn’t know that you couldn’t just dig a hole and just plant the tree. 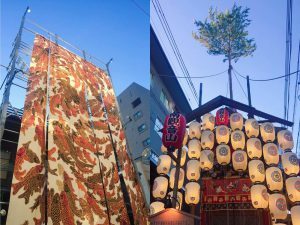 There is a risk that the new place could be a shock to the tree and would stop it from growing. He also informed me about little tricks like cleaning off the dirt by removing the grass and other things that would help. Overall I really enjoy doing this field work and learning about new things that I have never worked on in my life. 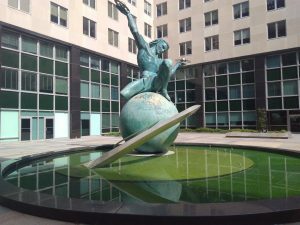 This summer, I have the incredible opportunity to intern at the United States Mission to the United Nations in New York, NY. 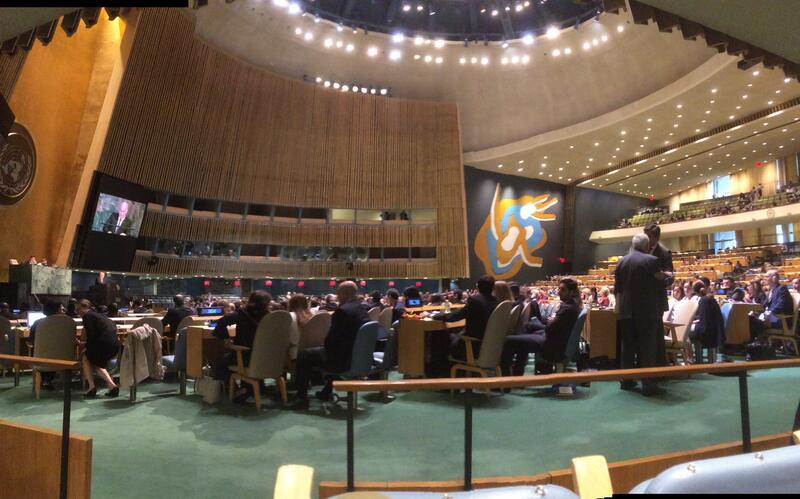 The United States Mission to the UN (USUN), headed by Ambassador Nikki Haley, serves as the United States Delegation to the United Nations, under the U.S. Department of State. 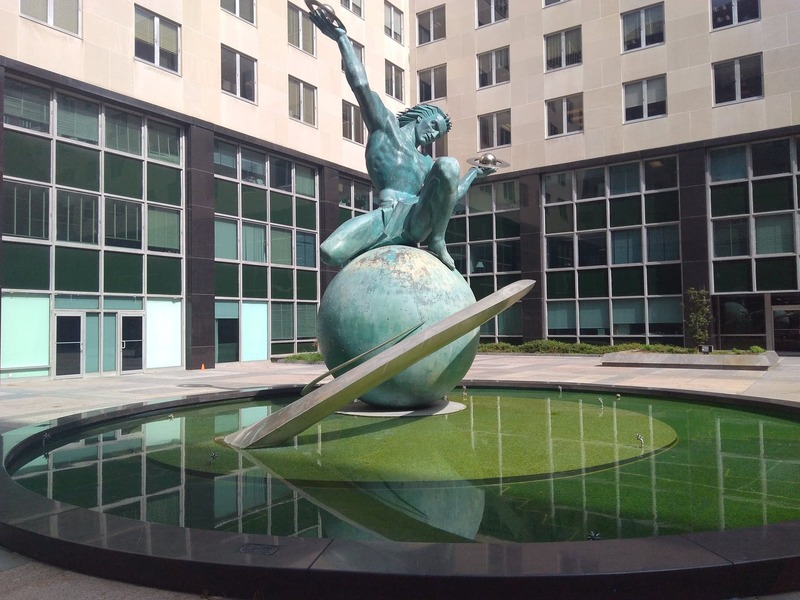 USUN works to advance U.S. foreign policy, especially in the realm of political, economic and social, legal, military, public diplomacy and management interests at the United Nations. As an intern, I have the opportunity to work both in the Research Unit and the Host Country Affairs Office. The purpose of the Research Unit is to provide assistance to policy-making officials at USUN by the research and analysis of existing U.S. foreign policy decisions, UN resolutions, historical facts, and UN related subject matters in relation with the United States. The Research Unit also maintains the Mission’s records. 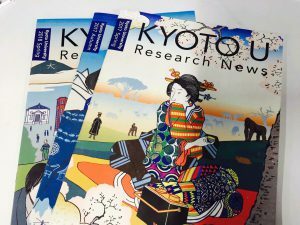 As an intern for the Research Unit, I help with any research requests the office may receive, with special projects specific to the needs of the office, as well as attend training courses at the UN in order to better comprehend the United Nations system. 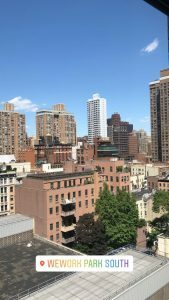 Separately, the Host Country Affairs Office assures that the obligations of the United States to the United Nations and the UN Community are upheld, serving as a liaison between the UN diplomatic community and federal and local government agencies. As an intern for the office, I work on projects specific to the department’s need during the current time, as well as have the opportunity to attend meetings related to managing the UN diplomatic community. 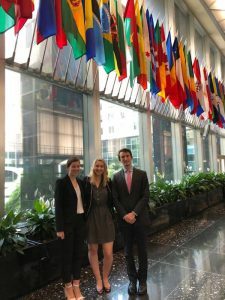 USUN does an incredible job of making the internship a holistic experience, rather than just a 9-5 job. 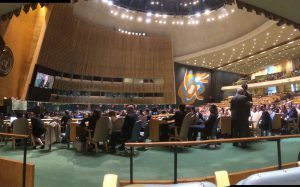 As an intern, I have the opportunity to attend meetings and events at the UN, and get to know government officials and other interns through lunches and networking events. Therefore, I have already met experienced government officials, undergraduate students who are interested in a similar career path as mine, as well as graduate students and law students. I am gaining a better understanding of the diverse career paths I can choose. This summer, I hope to take in as much information as I can, and learn about the intricacies of one of the most powerful international institutions in the world. I hope to apply my studies within the International and Global Studies major and the Health: Science, Society, and Policy major to the work that I am doing at the USUN. I hope to gain understanding about how political reform occurs in such a large and diverse international body, and to better understand the career path I would like to take and options that I have to pursue. I am excited to learn abou the inner workings of the international community that I am so grateful to be a part of for these ten weeks. This internship, already, does not feel as if I am simply an intern with no real place at the Mission, but rather that the Mission is almost as excited to have me, as I am excited to be at the Mission. My First Week Researching at Gervay-Hague Lab! My internship this summer is at Gervay-Hague Lab at the University of California, Davis. It is led by Dr. Jacquelyn Gervay-Hague. Gervay-Hague Lab, also known as JGH Lab, is a Chemical Biology lab that strives to learn more about the tea plant, Camellia sinensis, the medical benefits it offers, and the underlying reasons for these benefits. The lab website gives a lot of interesting context and information regarding the research taking place. For my project at JGH Lab, I am teaming up with a visiting Ph.D. student to continue to expand JGH Lab’s library of steryl glycosides. Steryl glycosides are compounds made up of two groups: sterols and glycosides. A sterol is a category of compounds that includes cholesterol among others; similarly, a glycoside is a category of compounds that includes common sugars like glucose and lactose. The process of expanding this library of steryl glycosides consists of fine-tuning the specifications of the reactions used to make the various steryl glycosides. Once this process is complete, we will run each reaction on a larger scale to create large amounts of product for future use. These products will later be used as probes to track the different processes that take place in the tea plant. Different types of tags will be used to further observe how the probes participate in the processes. Tracking these processes will help determine what factors contribute to the medical benefits of tea. When compiling the library of steryl glycosides and performing these reactions, Nuclear Magnetic Resonance (NMR) is crucial for identifying compounds. Pictured below is an apparatus used to clean the tubes used for NMR; this ensures that the NMR spectra contains information relating only to the desired compound. After performing a reaction, we are left with a vial or flask containing the desired product (hopefully) as well as a collection of unwanted side-products. A machine called GRACE pictured below can be used to isolate the desired product from the unwanted side-products. 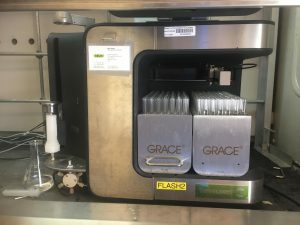 GRACE is a Medium-Performance Liquid Chromatography (MPLC) apparatus that works by using different solvents to elute different compounds at different times in order to separate products from each other, ultimately leaving the desired product. There are several goals that I made for myself before I began my research internship at JGH Lab. I am excited to see how far I can get in accomplishing these goals, and where this will lead me! My academic goal is to use what I learn from performing research in Gervay-Hague Lab to become more adept in my Chemistry and Biology courses. 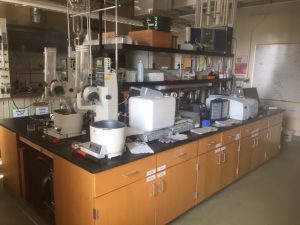 Just in this first week at JGH Lab, I have learned so much about different techniques used in Synthetic Chemistry as well as important things to take note of during reactions. Additionally, the biological context of this component of Chemical Biology. My career goal is to obtain a job and work there for 1-2 years after graduation. Then, I hope to enter a Ph.D. program in Chemical Biology or Chemistry. I am excited for this internship to better shape my career goals for the future as well as potentially relate in some way to a future job and/or Ph.D.
My personal goal is to learn how to communicate my research to others through posters, papers, as well as in person. Additionally, I hope to learn how to listen to others and learn about their research through these same methods. During my summer at JGH Lab, I will be able to communicate my research to the other members of the lab during group meetings, discuss it with them, and get their feedback on it. I am very excited to see what happens in the next couple of weeks! Author dcfarbPosted on June 15, 2018 June 25, 2018 Categories WOW Fellowship2 Comments on My First Week Researching at Gervay-Hague Lab! Rabbits and Owls and Ducks, Oh My! Hello! My name is Zoe Tai, and I am an extremely grateful Summer 2018 WOW Fellowship recipient. Let me start off with a quick introduction of myself. I am currently a rising junior at Brandeis University and am majoring in Biology and Neuroscience with a minor in HSSP; this summer I decided to go ahead and connect my interests in biology and field science with my passion for animals and nature. Through this search, I am now a proud Wildlife Care Intern with Mass Audubon’s Drumlin Farms Wildlife Sanctuary located in Lincoln, MA. 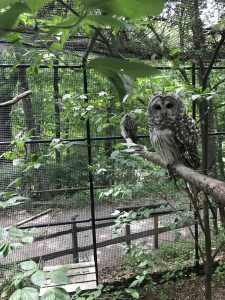 Drumlin Farms is an environmental educational center, a working farm and a wildlife sanctuary for native non-releasable species. Their mission is to protect the nature of Massachusetts for people and wildlife alike. 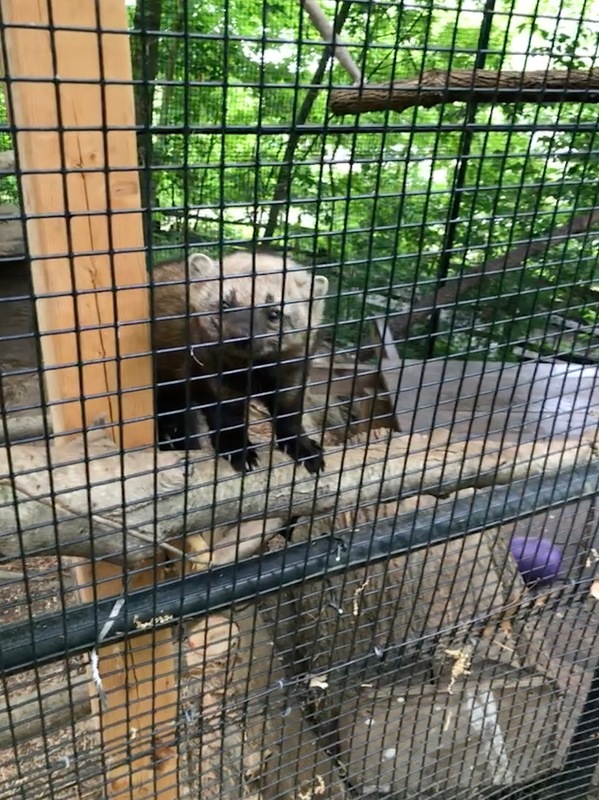 Drumlin Farm’s Wildlife Care Department (WLC), where I work, is a long-term care facility for injured or orphaned wildlife that cannot be released back into the wild. All of the animals at the sanctuary are residents that are often showcased during education programs or on exhibit for visitors of the farm. While they are not out on programs or out on exhibit they live in the Wildlife Care Center. 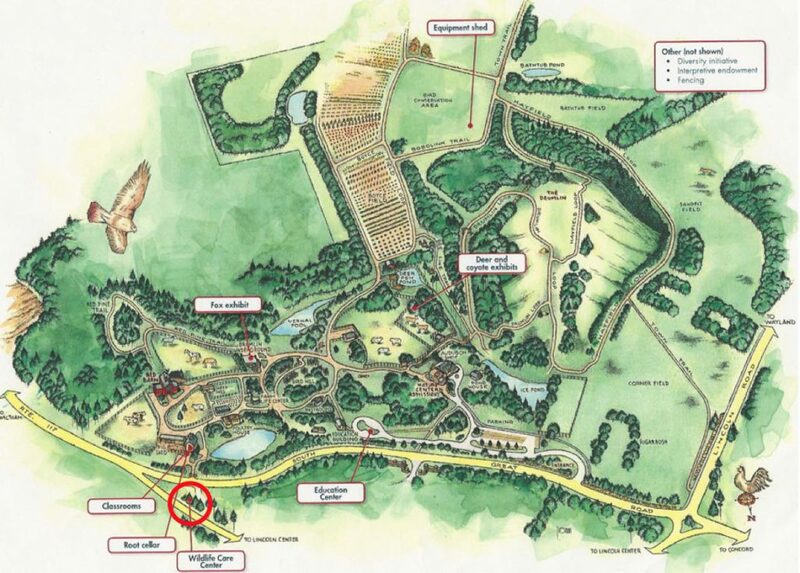 A map of Drumlin Farms and the WLC building circled in red. Illustration courtesy of The Lincoln Squirrel. Our resident fisher here at Drumlin Farms. She loves to sleep in her hammock! I get the privilege of working with these animals through daily tasks such as cleaning, training and prepping diets. Every day, the staff, interns and other volunteers roll into the building at 8 AM and start off the day by cleaning each and every animal enclosure. 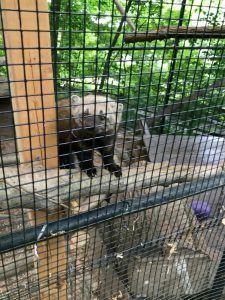 They have a pretty strict handling clearance process that begins with shadowing a staff member handling and cleaning the enclosure, followed by independently transferring the animals to their carriers and cleaning with supervision, to finally being cleared on the particular animal. Some animals are of course off limits to me, mainly the mammals such as the porcupine, the fisher, and the fox as they are rabies vectors. 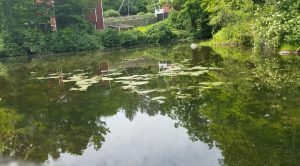 Even with these precautions and rules in place I still have had so many interactions with different New England species. In my first full week alone, I have been allowed to work with the domesticated rabbits, the ducks, the northern bobwhite, both the turkey vultures and the black vulture, the barred owls, the red-tailed hawks, and the painted-turtles to name a few, and there are still so many more. The diet counter where we prepare animal diets. 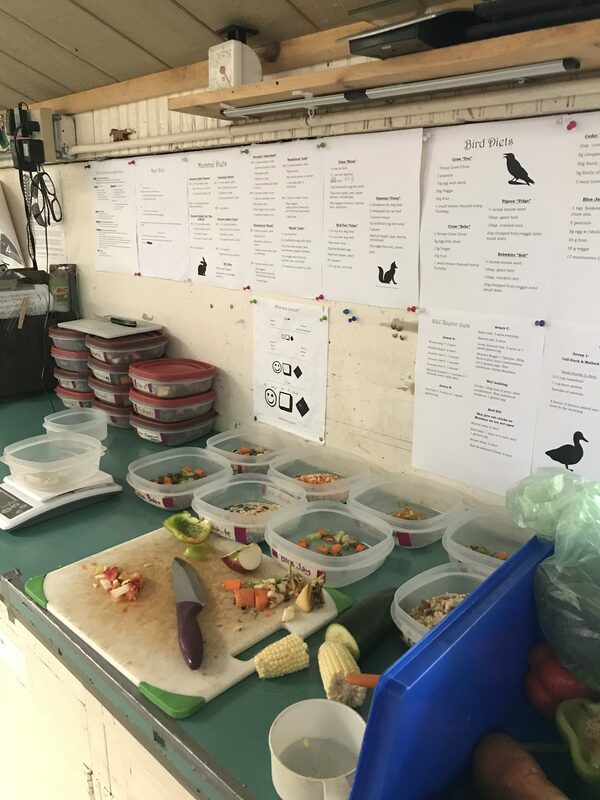 After we’ve cleaned every enclosure and have taken a lunch break, the other interns and I prepare the diets for all of our animals. We make sure that each animal gets the proper diet and try to mimic what they would naturally eat in the wild and follow a strict recipe tailored to each individual animal. With all the chopping and food prepping we do, the other interns and I are ready to become professional vegetable mincers. When all of the husbandry is taken care of, all of us interns meet with our supervisor and discuss our individual intern projects. During this internship, I will need to complete a project relating to wildlife care. Being the newest intern to the team, I have yet to decide on a project but many of the other interns have amazing projects such as training a timid barn owl to become desensitized and become used to human handling and interacting, building a new animal enclosure, and even a wildlife observation research project using night-vision trail cameras. 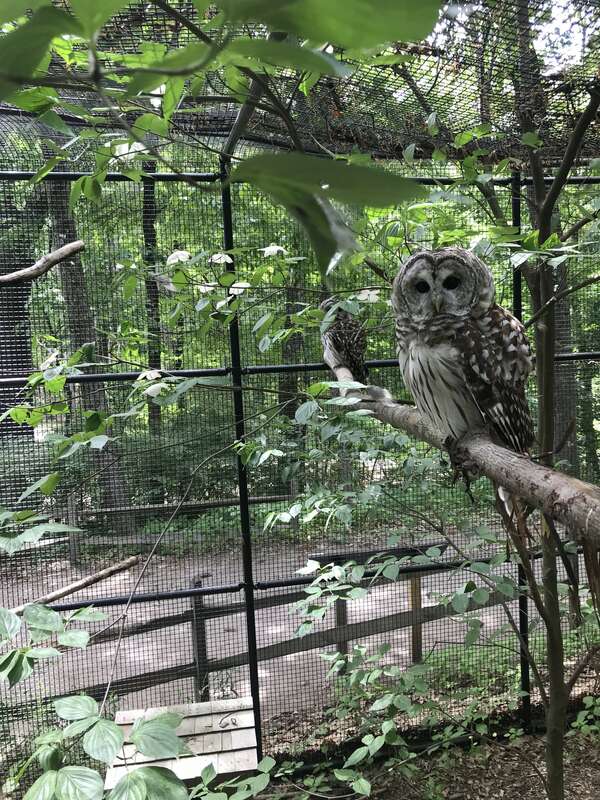 Two of our Barred Owls in their enclosure. This internship is providing me with a chance to directly interact with animals and learn about how to care and train them; something that I have never really experienced. With my interest in possibly pursuing veterinary school or field biology in the future, this is a once in a lifetime opportunity to dive into the grit and the wildness that comes with working with animals from an amazing and educated staff. My goal for this summer is to become familiar with all the species here on the farm and to be able to engage in conversations with visitors about animal behavior and habits to promote a responsibility for conservation and sustainability for nature. I have learned so much from this one week at WLC and cannot wait to see what the summer has in store! Author Zoe TaiPosted on June 11, 2018 June 25, 2018 Categories WOW FellowshipTags Animal care, farming, veterinary, WildlifeLeave a comment on Rabbits and Owls and Ducks, Oh My! 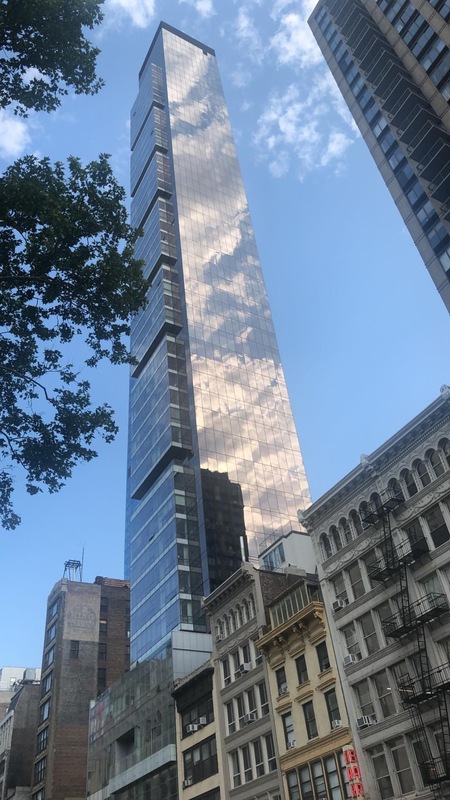 My first week has gone by and even though I had an idea of what to expect when arriving at the office space in downtown Manhattan in a WeWork building, I still wondered how things would go. To my surprise, there was also another intern who was starting on that same day. It made me feel a little better knowing that someone was at the same stage that I was and that we could figure things out together. After settling in, I got started on my first task which was to work within Trello and create an account. 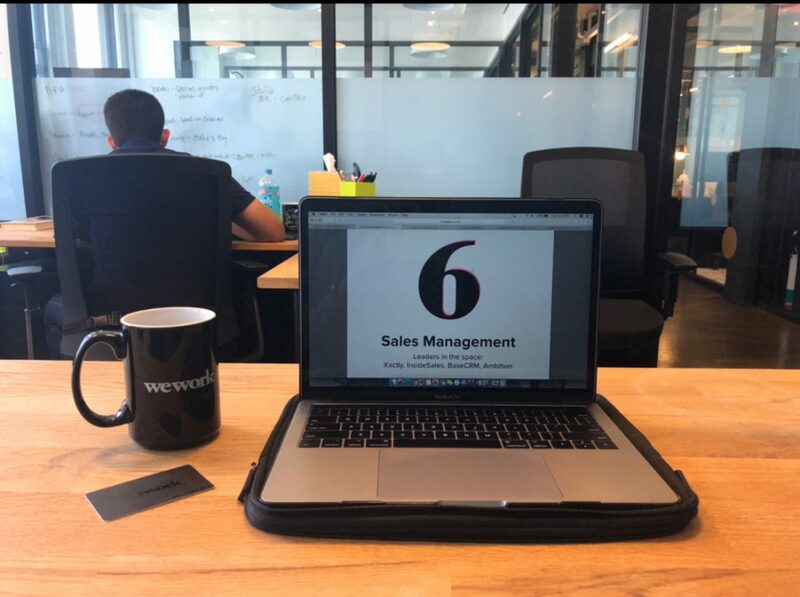 Prior to my arrival, my supervisor had set up tasks for me on a Trello board made up of readings about sales and what makes a good salesperson. On that same day, I was also given my Charity Miles email which made me feel like an official member within the organization. The days that followed consisted of me continuing the readings as there was a lot to cover. It was not until the final days of that first week that my supervisor told me to stop with the readings and move on to new tasks. One of those tasks included finding the POC (person of contact) at companies and compiling a detailed list to be used for outreach. I was excited to start doing some research and work with the other intern on this project. 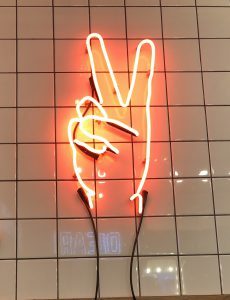 By the end of this internship, I hope to have a greater understanding of how small startups work and the decision-making process of finding potential partners and investors.